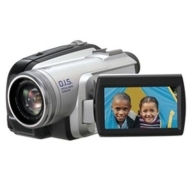 alaTest has collected and analyzed 9 reviews of Panasonic PV-GS83 MiniDV Camcorder. The average rating for this product is 4.2/5, compared to an average rating of 4.1/5 for other Camcorders for all reviews. People really like the design and image quality. The price and portability are also appreciated, whereas some have doubts about the usability. Reviews are divided on the zoom. We analyzed user and expert ratings, product age and more factors. Compared to other Camcorders the Panasonic PV-GS83 MiniDV Camcorder is awarded an overall alaScore™ of 76/100 = Good quality. Imagine taking video shots on a moving boat and then viewing them on a large- screen TV. They're likely to appear blurry from the boat's movement and from your unsteady hands. Panasonic solves this problem with O.I.S. (Optical Image Stabilizer), which minimizes hand-shake in situations where it is most often a problem, such as with zoom shots - or on a moving boat. The system is optical, so there is no quality loss, and images look clear and beautiful on a big-screen TV.